Anyone who's starting in the business would want to have a connection. Raine Musñgi was lucky to have one. Her father, the legendary Peter Musñgi a.k.a. the voice of ABS-CBN, was the most likely person to help her jumpstart her broadcasting career. But unlike the others, she made it all on her own. "I tried to dissociate myself from my dad who was then already an ABS-CBN executive by changing my name. But I got the job anyway, and it’s been an interesting ride ever since," she recalls. 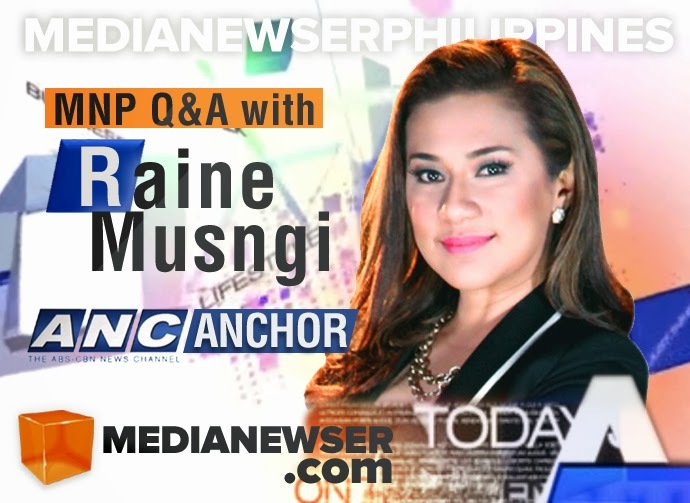 Since joining ANC, Musñgi has taken on a number of roles, currently as anchor of the news channel's early morning broadcast, while also serving as a supervising producer. 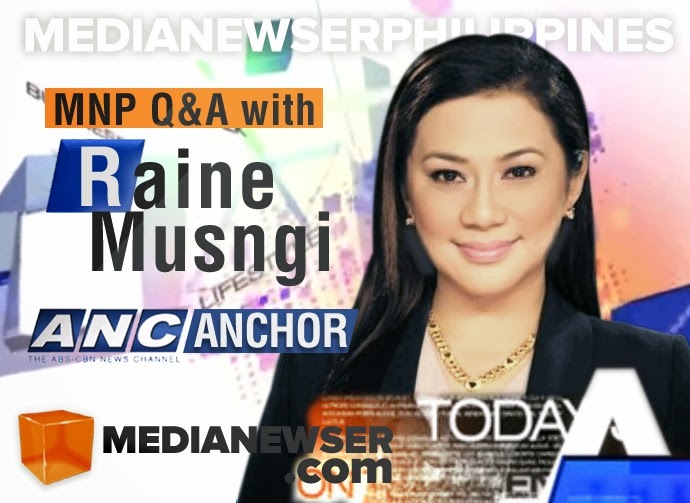 We talked to Musñgi — ANC's "Jill of all trades" about her blossoming media career, her take on Nadia Trinidad's entry on ANC, her experience in the world of corporate communications and marketing, and many others. Guiding Principle: Err on the conservative. Live so that you never regret a thing. Think out of the box. Go above and beyond. Prepare and anticipate. Hi Raine! Tell us something about yourself. I’m Raine Musngi, the only anchor in the country who is also supervising producer, and vice versa. I may be the only one who can source, write and produce my own stuff. Along with my team, we make sure ANC is awake in the wee hours here in Manila, and able to break news 24 hours a day, 6 of the 7 days a week, to the Philippines and the rest of the world. We are primetime news people for ANC on TFC in the Middle East, North America and Europe. I am a sister of OFWs and workers from the healthcare, hospitality, BPO and call center industries. I’m a mom, a custodian of two souls, a modern day vampire, a helper in the family business, a daughter, sister and a friend. How do you manage to wear those two hats so effortlessly? The functions are for the same shift. It helps that there is only one major news show during the 9-hour stretch, and the rest are top of the hour news. I have an extremely dedicated team who are service-oriented. They know who we do this for: the Filipinos in the rest of the world who are hungry for local news. We also do it for our own families. We also have great systems in place for breaking news, as well as a very involved leadership. And how do you handle the news operations when there is a breaking news during your shift? First, we check for what resources I have to be able to report it and request that from the staff: Reporters? Live Video? Graphics? Then I inform our immediate supervisor of the breaking news, so she can assess whether there is a need to call a backup team. Sounds like a lot of work. Do you ever get tired of your shift? It must be tiring for you? Certainly, the shift is challenging. It requires responsibility in my relationships, discipline in sleep and nutrition, as well as energy and schedule management. It helps that I have understanding superiors who allow me a reasonable vacation time to “catch some sun,” so to speak. What I enjoy on my shift is the capability to experiment, to try first-hand many production, sales and online executions that we can’t do during local daytime programming: New segments during the show, posts online, 5-minute edit-downs of our 30-minute show as a video podcast. Yes, the luxury to do something all on your own. And I have to say, ANC Headlines and First Look give us the best summary in the wee and early morning hours. ANC Headlines provides viewers with an update of the top 3 to 5 stories of the hour, at the top of every hour. ANC First Look is unique that it provides news that business and government leaders need to know for the day, in 30 minutes. It provides an outlook of what stories will affect their industries and people for the day, as well as market-moving news. This was trimmed into a 5-minute podcast for a time. What's the best thing about being a supervising producer? Do like the idea of being able to mentor the next generation of journalists? As supervising producer, I now handle a whole shift of shows, audiences, staff and business. While the foreign market and local audiences have different standards, their expectations are homogeneous: keeping the news stories and lineups short and significant, straight forward, and forward-looking. No fluff. And these suit my own personality just fine. It’s nice to receive good feedback not just from the business leaders but also from the OFWs whom we serve. It’s nice to be able to mentor a newbie and share experiences that might have been outside of their immediate experiences. It’s a good feeling to be able to grow talent and see them thrive even outside of your shift and shows. The network recently recruited Nadia Trinidad. What's your take on that? And what do you think ANC should to more and do less? I think we are already doing great with breaking news. Nadia coming in from ABS-CBN’s North America bureau will be able to keep an eye on smoothening operations as well as our numbers. Her immense experience covering local news and awareness of the impact of international news events will give us a well-rounded approach to our writing perspective and production. On top of what I'm sure Nadia is already working on, I’d love to see ANC be in higher demand in cable subscription, advertising, as well as exposure in offices of our target audiences. I’d also like to see more engagement from younger people, the next leaders of the country and the next generation of global Filipinos. ANC has a lot of competition these days. There's GMA News TV, Aksyon TV and Solar News Channel. What do you think is ANC's edge over these other news channels? We have always prided ourselves with being the accurate and balanced news source, as well as the only channel that can mount wall-to-wall coverage, from start to finish. We are the preferred and most trusted local news source by government and business leaders, as well as diplomats and expats. We have the regional and international resources that can feed us first-hand information. We are integrated with the News and Current Affairs teams within ABS-CBN and that includes DZMM Teleradyo. We have Sky Cable and TFC and access to the widest audiences in the country and across the world. And we are the first and most experienced 24/7 news channel. We provide in-depth analysis from the best resource persons. We have the time and respected network for it. All these are just unmatched in the industry. Some of your ex-ANC colleagues are now with Solar News. Would you also consider jumping ship in the future? I think if there is any challenge for growth at this point, it would be regional (Asia) or international. Who are your dream interviewees aside from Mark Zuckerberg and Gerard Butler? Oprah Winfrey and the Google guys (Larry Page and Sergey Brin). Locally, Gabby Lopez and Manny Pangilinan, the visionaries. I want to know first what they saw could be successful and how they made it happen, and how they see the future now. I also want to know what their everyday is like, what kind of timelines they demand and bargains they drive, what frame of mind it takes to build and continue to lead industries. Who are some of the few famous or interesting people that you have met? As a reporter, I have met quite a few people, none more important than those other journalists have met. In this shift, we are proud to be servicing an informed class: business and government leaders, expats and diplomats, and OFWs. Many of them I get to chat with online in between shows. It is a pleasure to hear the news we provide them not only set the tone and agenda for the day in news, but also in their lives. Prior to joining ANC, you had an experience working outside the news business (McCann Erickson and Cinderalla Marketing Corp). What was your experience with those two companies like? Being with McCann’s Business Development and Account Management groups for 2 years forced me to grow up. It was there that I got global training in corporate communications and strategic branding. It was very demanding and taught one how to be a multitasker, a sophisticated thinker. This was mind work. Being a Corporate and Marketing Communications Manager for Cinderella allowed me to have a hand in growing a local brand as it expanded. I learned how the local retail and fashion industry worked and who’s who among the players and how big a market we were dealing with. This was practical, on the ground work. You're a true blue Atenean. How has the institution shaped your view as a journalist? Having a heart for service, answering the call to be a woman for others. The challenge upon graduation was to use one’s talents and resources in a position of influence to help the most number of people. I think being a journalist does just that. And who do you look up to in the business? Maria Ressa, Cheche Lazaro, Ces Drilon. They have guts and gumption and smarts. They are elegant and sophisticated thinkers and doers. They tackled everything from terrorism to business to legislative news, yet delivered always the heart of the story, weaved it with heart. They focused on the person, the people affected. Yet they remain entrepreneurial in their stories. They do their own writing, conceptualize their own shots. They all have an amazing network of sources as well as friends. They are the consummate journalist. I would love if one of them mentor me. Do you watch the competition? What non-ANC shows do you watch? Yes, I watch local competition, as well as CNN, BBC and Aljazeera. But mostly, I rely on our internal outlooks and wire alerts to stay ahead of the news. Do you believe looks do matter on TV? Just like with food, an appetite for the news will have to be half about the substance of the news one delivers, and how it is delivered. The anchor’s elements must simply be pleasant and credible, not necessarily pretty or handsome such that it will distract from the news being delivered. At this point, do you still get nervous being in front of television? Yes, because it is live television. We do our best to prepare the scripts, the production, the makeup, the studio. But as a team effort, sometimes, despite our best intentions, technical or timing problems arise. Hopefully, we have a solid Plan B to fix any possible issues. What's your favorite story to report on? Consumer news. It’s the cost of living, how to upgrade our standard of living. It’s the ways we can get ahead of everyday challenges: housing, power/fuel/energy, education, banking and savings, transport and communications. These are all facets of life that sway our decision-making everyday. And my favorite question, what is news for you? News is what’s new and relevant and moves one to feel, act, or make a decision. What's your take on infotainment journalism? I use it, if it achieves a higher goal: service, assistance and empowerment. As the daughter of the legendary Peter Musñgi, did you always dream of joining the industry? No. I always thought I would be a lawyer or businesswoman. But I have always loved writing, spoke well enough, been recognized at home and school for getting projects done. Corporate work seemed to be the logical path. But one day, my father said that the then-Sarimanok News Channel was holding auditions for reporter and I could do well. Tidbit: I tried to dissociate myself from my dad who was then already an ABS-CBN executive by changing my name. But I got the job anyway, and it’s been an interesting ride ever since. How do you manage both your personal and professional life? Separately. I like to believe that when I dress down, and the makeup and suit are off, I am unrecognizable as the public personality. So I am able to freely conduct normal business and family life. One school of thought in journalism is that nothing is ever is completely devoid of bias. While we as journalists always strive to be balanced and ethical, I think it’s important that people know where I am coming from. I had been raised by a middle class family, educated in good local schools. I’m a daughter, sister and mother and my reportage will always be representative in some form or manner from this kind of background. What do you want to do next? Do you envision yourself still doing this for the next 10 years? I will be of service to the journalism field for as long as I am useful to our audiences, and it provides well for my family. Again, I think the next growth opportunities would be regional or international functions, or internal management options, or growing our family businesses. I’d also like to be able to write more online. What's the best advice you can give to aspiring broadcast journalists out there? I think if they have a service-oriented heart, a principled mind, a love for writing and reading, an eye for history as well as a dream for a good future, along with (ahem) some guts to manage the camera, then broadcast journalism could be a great career for them and they should claim it.